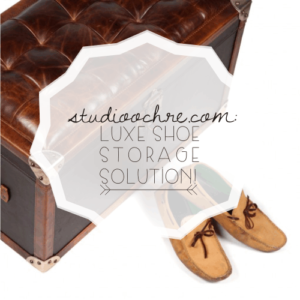 Storage solution for luxury shoes! Now, let’s admit it, women are blamed wrongly for their fetish for shoes, bags or any accessory for that matter. I’ve seen men going ga-ga over shoes every time they are out for shopping and at home they sleep with their shoes on (and sometimes on their shoes, quite literally). For all you men who more or less fall in this category- here’s one great piece of furniture for all your luxe, priceless shoes! The shoe trunk as they call it, has an opulent feel to it and you can store as many as eight pair of shoes in it. You can also use the very comfortable leather top to put them on while sitting. Your very own trunk for shoes! On second thoughts, why men, absolutely anyone would love to store their shoes in this trunk! It is made out of genuine leather and can very well sit as a décor element on your entryway. So all you luxury shoe collectors out there- don’t take your shoes for granted- just trunk them! Looking for other kinds of storage solution, click here. ← Got late in sending your Rakhi? Don’t worry, send it now!